Stop reading this and go buy yourself some bananas! If you already have scary-looking bananas on your countertop then just take a moment to imagine yourself biting into one of these. Can you appreciate the hugeness of these muffins?! My sister-in-law gave me this set of 6 silicone “Texas-sized” muffin cups (as they were advertised on the packaging). Wow! 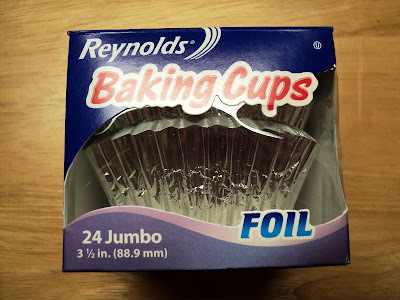 I knew right away that I wanted to make some kind of streusel muffin with these big boys. Whenever I have a streusel muffin I’m always sad when the topping is gone. I keep looking down at my muffin hoping that more of the buttery topping will magically appear. I have taken my favorite parts of every banana bread that I’ve made through the years and have tried to come up with the maximum banana flavor for this recipe. These monster muffins pack 4 bananas into 6 muffins!! The secret to jamming 4 bananas into these muffins is using your mixer to whip them up into a fluffy mess before folding them into your batter. Mmmmmm. Of course you could skip the streusel topping – they would still be coffee shop worthy. Mix up a batch of these today and have a friend over to impress. You could even charge your friend $5.00 if you want. Okay, so don’t do that. $3.99 is just fine. Whip up bananas using the paddle attachment on your mixer for 3 – 5 minutes or until light and fluffy. It should end up being about 2 1/2 cups of banana fluff. Transfer to another bowl and set aside. Cream together the butter and brown sugar in the bowl of the mixer (there is no need to wash off the paddle or bowl from the bananas). Add eggs one at a time and then incorporate the whipped bananas until well blended. In a separate bowl combine flour, baking soda, and salt. Gradually add the dry ingredientsto the wet. Spoon batter into prepared cups. Melt butter in the bottom of a medium microwave-safe bowl. Add the dry ingredients on top. IMPORTANT: Incorporate the dry ingredients with your FINGERS until the mixture is moist and crumbly. If you try to use a spoon it will congeal into one huge ball of goo. Drop the crumb topping onto the muffins and bake. These look delicious! My husband and I eat at least 3-4 bananas a day…so I will be saving some to make this recipe this weekend 🙂 Thanks! Oh how I want one of these. I love streusel too, but there never seems to be enough of it. Great tip about whipping the bananas first to make them light. That’s the one drawback to using bananas in baking. Who am I kidding… there’s no drawback. These look really great. I make a banana bread with a streusel topping that I really like but you just cannot go wrong with a muffin and yours looks amazing!! these look gorgeous! my husband LOVES banana bread…I could make these for him to bring to work! 🙂 THANK YOU! These look so yummy! 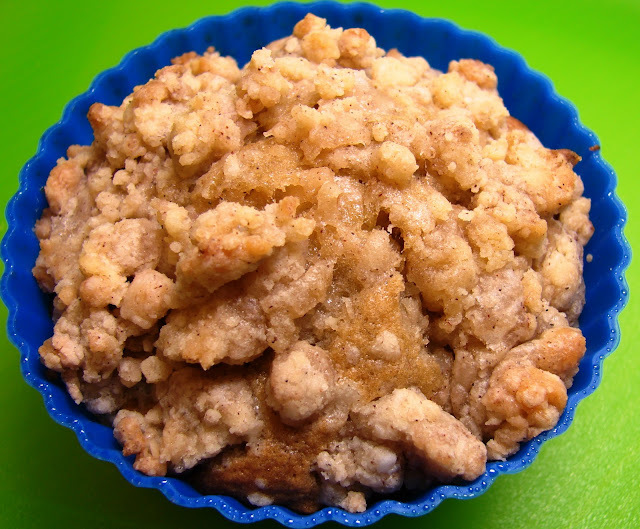 I love muffins with streusel on top! I do love jumbo-sized muffins. Delicious! And with a streusel crumb, they are just that much better. Ooooh I like that the crumble just keeps on going. I use my muffin top pan because I can’t get enough of the topping, but this is a great idea! Love banana breads. I could see myself making these goodies..Look amazing Katrina! When are you going to open your coffee shop? these muffins look like they came from one. 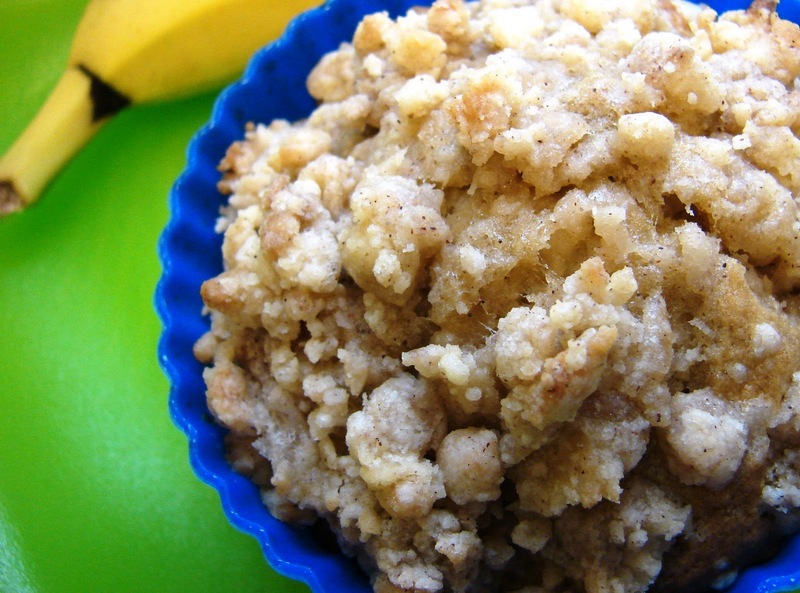 I love bananas in baked goods, so I’ll be making these soon. Did you like the silicone muffin cups? Yum!! Even better is that I have some scary looking bananas to use right now. I can’t wait to try these. K – does frozen banana work as well? Bananas and cinnamon sounds like the perfect combination to me. Becky – I did love the silicone cups. I’ve had mixed results with silicone before but these were perfect. I would have commented earlier but I had to go buy some bananas! Delicious recipe. The cinnamon is a nice touch. Wow these look delicious! I just made peanut butter banana bread, but next time I’ll have to try this recipe! Thanks for the buzz, Katrina! I love your blog title, it’s very cute. Did you design it yourself? Glad we are connected! Love the way the surface of these muffins look. So scrumptious! Yum! I’m really happy you all are enjoying this recipe! Really – the streusel gives a lot of bang for not a lot of effort. Stop by my Facebook page and feel free to post a picture of these from your kitchen. I would love to hear if you make this recipe! Just made some marvelous smelling jumbo muffins from this recipe. Love the topping. Thanks for sharing it! 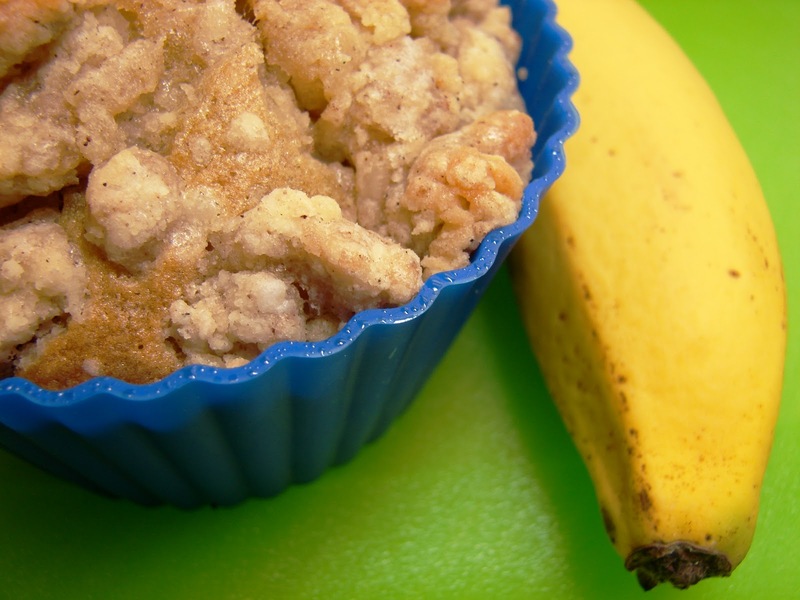 What a wonderful combination, I love bananas and muffins, so I am sure I would love them as well! Haha I always have bananas that start to look funny by the end of the week… I’ll definitely be using this recipe next week when I have extra ripe banana’s left over! Thanks! These look amazingly delish! Love the streusel on top and how it just sits there so lovely! Will definitely be making these. Love them texas size too! Just posted a link on my site (http://eliotseats.com/) praising this recipe (and with a pic). You have such a fabulous blog! These muffins looks so mouthwatering! These sound absolutely delicious! I love the streusel additon! I have a TON of over-ripe bananas that I need to do something with! I usually make banana bread, but I love anything with a good streusel topping! YUM! I made these today. They just finished cooling seconds ago, and I tried one…They are the most amazing muffins! The struesel was crunchy and oh so delicious! Thanks for sharing. My daughter made these muffins for my “Mother’s Day” breakfast. They were absolutely wonderful. I love banana muffins and have a number of different recipes for them; however, this recipe surpasses all that I have in my collection. I will use this recipe from now on when making banana muffins. Thanks for sharing! Ok… My streusel turned out a big ball of goo… What did I do wrong? I didn’t use a spoon either I used my hands. I’m just now seeing this comment- but if this ever happens you can add more flour or powdered sugar. The mixture was likely too wet too quickly. omg!! soooo delicious! Very glad I made a double batch! just made. these are very good! i was worried about the strudel becoming too wet. i just used VERY soft butter and the edge of a fork. i did not want my body heat to also be too much for it. worked out great! I’m glad you tried it and loved it- thanks for stopping back to let me know! Just made them. Absolutely fantastic. Truly the best bannana muffins! Thank you for the recipe! I usually sub applesauce for the oil in muffins, would I sub it for the butter? If so, do you think that would totally ruin the flavor? These are fantastic! The best (and now ONLY) banana muffin recipe I will make. I used frozen bananas (froze in skin and immersed in hot water to defrost -tip from woodland bakery blog) Also doubled the struesel topping. Mine kinda turned to goo so I spread (packed tightly) on a baking sheet and popped in fridge then broke into pieces to top muffins. Doubling gave wonderful topping to muffin ratio! I made these this morning. I’m not a great baker but these turned out incredibly delicious, super moist, and looked great too! I was skeptical about the streusel recipe but it was perfect! The only thing I did different from the recipe was to add about 1/2 C pineapple yogurt. I got nervous it was going to be dry. They probably would have been just as delicious without it. I’ll share this recipe with everyone! This recipe is AMAZING!!! The muffins come out so soft and moist! I did however have to make a few changes. First, I was out of butter so I subsituted crisco for butter in the muffin recipe, and coconut oil for butter in thee streusel recipe. Second, I added 1/2 cup of chopped pecans to the muffins, and 1/4 cup ground pecans to the streusel. Last, I added 1/2 teaspoon cinnionman to the muffins. They came out great! They looked delusions and tasted even more delicious! Thank you so much for your recipe! It will be one I use for a life time! I just finished baking these deliciously moist muffins that I found on Pinterest and they are a winner! Not overly sweet, which I like. You could add a powdered sugar icing drizzle over the streusel if you like them sweeter I guess. My recipe made 12 regular muffins plus 8 mini muffins. I quickly whipped up another half recipe of streusel for the minis. This is going on my Pinterest Tried and True Board so that I can easily find it next time! Thanks! I love making these muffins for my family. I’ve been using all-purpose flour and was wondering if I could use whole wheat flour instead? Thanks! I just made those muffins this morning. Wow! The muffin is soft and moist. Yummy! Thank you for sharing this recipe on Pinterest! I just made these and they are in the oven as we speak! I did change thetopping… I did not melt the butter and it was beautifully crumbly. So that might help with other peoples problems with the topping. I also made these in mini loaf pans and it filled 4 really nice. I have been waiting to use this antique loaf pan since I bought it and this seemmed like the perfect time. Thanks for the recipe! These are the perfect texture…light and fluffy with crunchy streusel. It takes like pie on a cupcake. I did have to add some vanilla, chocolate chips, walnuts and cinnamon to the batter tho. Otherwise it was a tad too plain. Found this recipe on pinterest today. I replaced 2 Tbsp of the butter in the streusel with peanut butter and melted them together. Otherwise I followed the recipe exactly as written, including some chocolate chips. They are soooo good! Very light and fluffy. My bananas did not get fluffy. More liquid like. What did I do wrong? These were absolutely perfect! I made as directed and YUM! I just made these. I made 1 and 1/2 the recipe because I wanted to use the 6 bananas I had. I thought it would make 18 because original recipe said it would make 12, but it made 2 dozen regular and 3 jumbo. Pretty plain and simple, but good. regular size took 21 min. in my oven. I think they needed a little cinnamon in the muffin too. Overall a good recipe. In the oven! Smell and look great! A few tweaks ( cinnamon,brown sugar) added to the topping. Can’t wait! Can this recipe used for a loaf instead of muffins? ?